While we frequently cover navigation applications here, sometimes you need a way to get access to the data you need when you’ve reached your destination. That’s where iRdesktop looks to come in, though maybe not as well as some might like it to. iRdesktop will provide a way for users to access their desktops remotely via their iOS device of choice, whether it be iPad, iPhone, or newer-version iPod Touch. It will work with most any version of Windows that has support for Terminal Services, including a wide array of Windows options from Windows XP Home (though it’s going to need to include Thinstuff XP / VS Terminal Server) all the way up to Windows 7 Professional, Ultimate, or Enterprise. 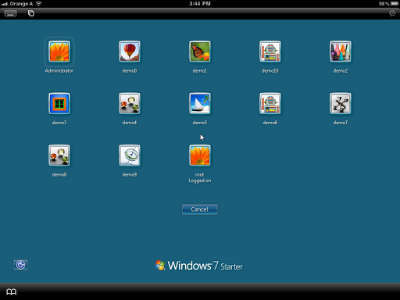 iRdesktop will also pack in some extra features for added value and benefit working with the desktop. It will offer up mouse emulation, including standard functions like left-click, right-click and double-click, as well as drag and drop. Text entry is as easy as the standard iPhone keyboard–which isn’t always the most easy to work with on larger projects but should do the job nicely for the small stuff–comes available to handle that. Rotating the device can easily change the view between portrait and landscape, and pan and zoom services are also available. For added security, iRdesktop can work with the VPN–Virtual Private Network–included on the iPhone. There are some issues with iRdesktop that need to be considered before giving this one a try. First, there’s no support for TS Gateway on this one, which will particularly impact those users running Windows Server 2008. Second, there is neither support for sound or for clipboard redirection. There is, however, a 14 day free trial, so users can get a handle on whether or not it’s just what they need before stepping up to the full version. While it’s important to have a handle on all the information you need when you’re out in the field, just a command of information alone won’t help your small business pull in the sales. Make it easy for potential customers to contact you with cloud-based telephony tools like hold queues to help narrow the time spent on hold and a toll-free number to ensure customers have the least risk involved in making that call. Most users, however, should find iRdesktop a reasonably sound alternative, and exactly the kind of thing they’d need when they need remote access to things stored on a full computer desktop in the field.